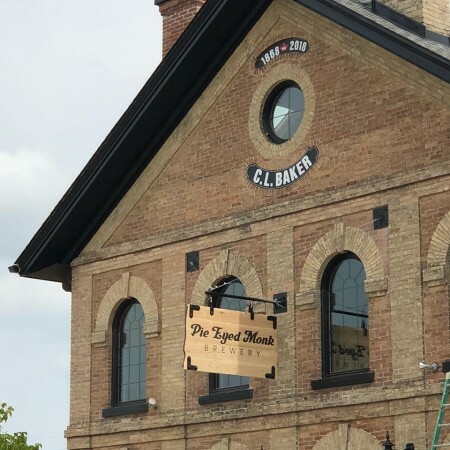 LINDSAY, ON – A brewery and restaurant located in an historic building in downtown Lindsay has announced that it will be officially opening later this week. Pie Eyed Monk Brewery has been established by Jennifer Boksman and Aaron Young in the C.L. Baker Building, which was built in 1868 and originally used as a grainery. Renovations have taken place over the past year, and the three-floor space includes a 7-barrel brewhouse overseen by brewers Sandra Chadwick and Keanan Schiedel-Webb, retail store, events space, offices, and a taproom and restaurant offering a menu of wood-fired pizzas, pasta dishes, and pub favourites. A soft opening of the retail store took place this past weekend, with cans of four beers – Murph’s Daily Ration Irish Extra Stout (4.5% abv), Brownie’s Belgian Blonde (5.5% abv), Laughing Troll Lager’d Ale (5% abv), and Dirty Bird Unfiltered Rye Beer (6.5% abv) – available for purchase. The opening of the restaurant and bar will follow this Thursday August 9th, and the four aforementioned beers will be on tap along with First Responder Amber Ale (5.5% abv) and Blasphemous Rumours IPA (6.5%), the latter named via a Name Our IPA contest won by Ron and Cindy Oneil. For more details, see the Pie Eyed Monk website and Facebook page.